With the placement of each order, you are agreeing to the acceptance of the following terms and conditions. These terms and conditions shall supersede any subsequent terms and conditions included in any purchase order unless agreed to in writing by No Skidding Products Inc. ("No Skidding"). PRICING & SPECIFICATIONS - All prices reflect Buyer's net cost in US Dollars and do not include applicable taxes. The majority of our items ship from our US warehouse via FedEx Ground (or FedEx Air) or economical carrier via standard ground transportation routes. Prices, colors and specifications however, are subject to change without notice. We do reserve the right to ship from our Toronto location as well but freight is calculated from our Buffalo, NY location. PAYMENT TERMS - For Customers with approved credit, payment terms are net 30 days from date of shipment. VISA, MASTERCARD, AMERICAN EXPRESS orders are accepted. SHIPPING - Most in stock items ship within 48 hours of receipt of your order. Estimated delivery times for custom, special or non-stock orders are provided upon request. Any extra charges for service requested by Buyer, i.e., special routing, inside delivery or pre-delivery notification are payable by Customer. DAMAGED SHIPMENTS; RISK OF LOSS - Customer should thoroughly inspect all items for shipping damage before accepting delivery. If damage has occurred, Customer should note the extent of the damage on the freight bill and call No Skidding immediately. No Skidding's responsibility for loss or damage ceases at the time the purchased products are accepted for shipment by a carrier. However, to accommodate our customers, No Skidding, will when notified promptly within 48 hours of a damaged shipment on any of its designated carriers at Customer's request, file a damage claim, issue credit for the damaged goods and promptly arrange for shipping of replacement goods. Customer, in turn, shall at No Skidding's sole discretion return any or all of the damaged goods as directed by No Skidding Products Inc.
RETURNS - If you are dissatisfied with a product you receive from No Skidding Products Inc., you may at any time within 30 days from your receipt of shipment return such goods for an exchange or a credit or refund less a 20% restocking charge. Custom and made-to-order products are not returnable unless defective and within 30 days. For all returns, simply contact No Skidding's Sales and Customer Service Department for a Return Goods Authorization and shipping instructions prior to returning any products. Returned products must be shipped prepaid, in re-saleable condition and are subject to inspection for damage or misuse prior to issuance of a credit or refund. Products not returned within 30 days of receipt are not returnable. This policy relates to product purchased from this site. WARRANTIES - All products are warranted for a period of one-year (1) by the manufacturer to the extent of the manufacturer's express warranties to No Skidding or (2) by No Skidding to be free from defects in materials and workmanship under normal use and service. This warranty is exclusive and is in lieu of any other warranty, express or implied, including, but not limited to, any implied warranty of merchantability or fitness for a particular purpose. 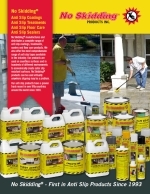 The sole and exclusive maximum liability to No Skidding shall be the price of the product ordered. No Skidding shall not be liable under any circumstance for consequential or incidental damages, including but not limited to, labour costs and loss of products arising in connection with the use of or inability to use products purchased from No Skidding. No Skidding shall not be liable for any delay in or impairment of performance resulting from any circumstance or causes beyond its control in the conduct of its business (force majeure). No Skidding Products Inc. IS NOT RESPONSIBLE TO YOU IN ANY WAY FOR ANY DAMAGES, INCLUDING, BUT NOT LIMITED TO, DIRECT, INDIRECT, SPECIAL, ECONOMIC, PUNITIVE OR CONSEQUENTIAL DAMAGES, ARISING FROM ANY CAUSE WHATSOEVER. 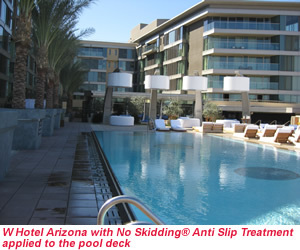 No Skidding Products Inc. shall not be liable for any special or consequential damages that result from the use of, or the inability to use the products sold on our website(s) or the performance of these products. 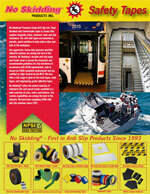 These products can help reduce slips but cannot eliminate slips. CONTROLLING LAW - The validity, construction and enforcement of the purchase agreement between No Skidding and the Customer shall be governed and interpreted in accordance with the laws of the Province of Ontario, Canada.